The feast of the Immaculate Conception is a Dogma of the Catholic Church. It maintains that from the moment when she was conceived, the Blessed Virgin Mary was kept free of “original” sin, and was filled with the sanctifying grace normally conferred during baptism. It is one of the four dogmas in Roman Catholic Mariology. 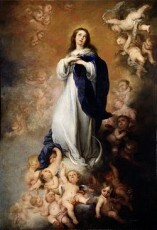 Mary is often called the Immaculata, the “Immaculate One”. The Immaculate Conception should not be confused with the perpetual virginity of Mary or the virgin birth of Jesus. It refers to the conception of Mary, by her mother, St. Anne. Although the belief was widely held since the early Church, it was not formally proclaimed until December 8, 1854, by Pope Pius IX in his Papa Bull Ineffabilis Deus. It has since been observed on December 8th, and is a Holy Day of Obligation. The Dogma of the Immaculate Conception gained additional significance from the apparitions of Our Lady of Lourdes in 1858. At Lourdes, a 14-year-old girl, Bernadette Soubirous, claimed that a beautiful woman appeared to her and said, “I am the Immaculate Conception”. In this sense, the dogma of the Immaculate Conception defined by Pope Pius IX is also viewed as a key example of the use of “sensus fidelium” shared by believers and the Magisterium, rather than pure reliance on Scripture and Tradition. The Vatican quotes in this context “Fulgens Corona”, where Pius XII supported such faith, “If the Popular praises of the Blessed Virgin Mary be given the careful consideration they deserve, who will dare to doubt that she, who was purer than the angels and at all times pure, was at any moment, even for the briefest instant, not free from every stain of sin”?